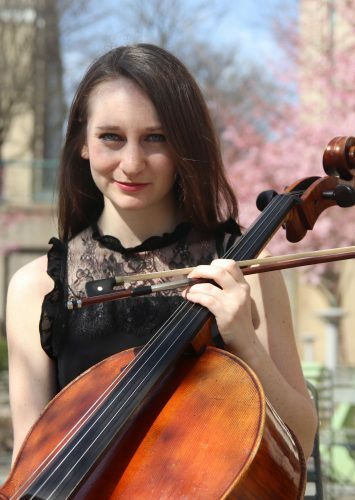 Eva Ribchinsky was born in New Haven, Connecticut and began her cello studies at the age of 6 with her mother, Julie Ribchinsky. Eva has taken part in various masterclasses with renowned cellists such as Alexander Kaganovsky, Vladamir Penteleyev, Anzel Gerber, Timothy Eddy, Allison Wells, Mihai Tetel, Natasha Brofsky, Paul Katz, Julia Lichten, and many more. Her principal teachers have included Anne Martindale Williams in Pittsburgh, Richard Weiss in Cleveland, Dr. Kangho Lee, and Dr. Katie Schlaikjer in Connecticut. Eva has performed in many recitals and concerts throughout the USA, Europe, Canada, and Mexico, including performances at the Auditorium Giovanni Arvedi (Stradivari Museum) and the Pallacio de Bellas Artes in Mexico City, along with performances in numerous orchestral settings including the Carnegie Mellon Philharmonic under the direction of Andres Cardenes, Orchesta Filharmónica de Jalisco, the Erie Philharmonic, the Cleveland Institute of Music Orchestra, the JVL SSPA Festival Orchestras, and prestigious symphony orchestras throughout Connecticut, among others. An advocate in new music, Eva has performed in many concerts with the CMU Contemporary Music Ensemble under the direction of Daniel Curtis. An avid chamber musician, Eva utilizes her love of chamber music through both international and local performances, education, and outreach. She has performed in numerous chamber music recitals throughout the United States and Europe. She was a founding member of the Cleveland Cello Quartet, a genre-bending ensemble of CIM graduates, which was the Ensemble-In-Residence at The Music Settlement in Cleveland, OH. Eva has recently worked with celebrated artists including Anne Williams, David Harding, Christopher Wu, William Vandersloot, Peter Salaff, Dmitri Papadamitriou, Bronwyn Banerdt, Jeffrey Turner, Caroline Warner, the Cavani String Quartet, the Jasper String Quartet, and the Colorado String Quartet, among others. Eva has participated in numerous summer music festivals including the Aria International Music Academy, Elm City Chamber Music Festival, and Point Counterpoint Chamber Music Festival. Eva completed her undergraduate degree from the Cleveland Institute of Music in 2016 with Richard Weiss, and her Master’s degree from Carnegie Mellon University in 2018 with Anne Williams. A passion for orchestral playing, Eva has pursued her orchestral studies with David Premo, assistant principal cellist of the Pittsburgh Symphony Orchestra and Stephen Geber, former principal cellist of the Cleveland Orchestra. Devoted to music education and advocacy, Eva is presently a faculty member of the JVL SSPA Music in the Summer in Ontario and the Cremona International Music Academy in Cremona, Italy. While living in Cleveland, Eva taught at the Cleveland School for the Arts. Eva completed her Suzuki teacher training under the tutelage of Pamela Davenport and Dr. Melissa Kraut at the Cleveland Institute of Music. She is certified with the SAA to teach Suzuki cello through all levels from Every Child Can through Books 1-10. Eva was a graduate teaching assistant in advanced Dalcroze Eurhythmics during her studies at Carnegie Mellon University. Eva plays on a 2016 cello made by award-winning maker Benjamin Wilke.